Part of the fun of contemporary poetry is the fact that it is culturally marginal in one sense (at least compared to TV box-sets and Tumblr) but has a large dedicated audience. That combination of sometimes fringe-y art concerns and an attentive public affords poets and publishers a chance to play around, resurrecting old formats to suit their muse. Poetry has kept otherwise obsolete formats like pamphlets and chapbooks alive. 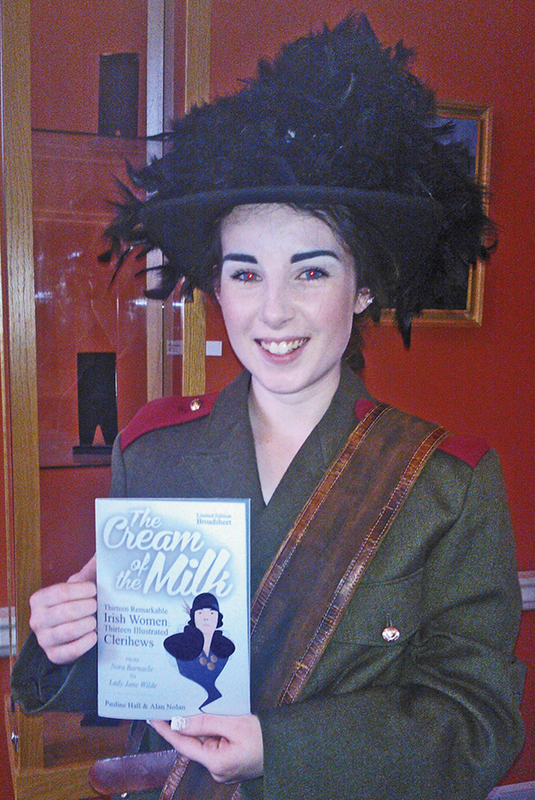 This issue’s poetry page focusses on a broadsheet: a pamphlet which folds out to a poster-size, entitled The Cream of the Milk, a collection of clerihews (whimsical, four line biographical poems) on famous, influential or infamous women from Irish history and legend. The poet is Pauline Hall, and each of her poems is accompanied by an illustration, by cartoonist and graphic designer Alan Nolan. Broadsheets are traditionally a cheap, almost disposable style of presentation intended, like chapbooks, to be shared or traded, rather than necessarily being given pride of place on a book shelf. The Cream of the Milk is no cheap mass-produced artefact, though. Each copy from the limited edition run is handsomely and vividly printed in full colour, on quality paper. NewsFour spoke with the creators about their collaboration. As a collaboration, the result is an uncommon but complimentary mix of word and image. The Cream of the Milk may be just that, of this year’s literary oddities. And who knows, maybe it will spark a broadsheet comeback? Time will tell. See www.creamofthemilk.com to order a copy.